I'm A Fan » My dad, the audiophile. So much of my book focuses on my stepfather and it’s not fair to cut out my real dad, the audiophile. I say that because he never jumped onto the CD craze nor the cassette. My father is old school. He’s a reel-to-reel man who cruised Des Moines, Iowa in deep sky blue 1972 Thunderbird with an 8-track tape player playing the greats from Beethoven on synthesizer to Ray Coniff. If I ever pissed him off with my music, he would turn to me and say, “What you’re listening to isn’t rock n’ roll, son. I grew up with Elvis Presley. He was rock n’roll. What you have today is just noise.” But……he still kept buying me my KISS records. In fact, he bought me my copy of Destroyer from which my fascination with the leather-clad band began. I’m sure he’s happy I have moved on and yes, I do covet the simplicity of Elvis and Jerry Lee Lewis. Who else could sing about getting it out in a chicken coup? My father’s a simple man, a creative man and a big-hearted man. I carry some of those characteristics inside me. Just ask my wife….“that is something that would come out of your Dad’s mouth.” Which is very reminiscent of my mother…..“your just like your father.” I wear these statements like badges of honor even though that wasn’t always the case as a kid. I wasn’t rebellious but stuck doing a balancing act pleasing both families and not pleasing myself. I had my escapes and music was one of them. Dad instilled it in me. I would go to visit my father and one of my first requests was, “Dad, can you play the Lone Ranger theme on the stereo?” That is only way I knew the William Tell Overture by Giochino Rossini was by the masked ranger I saw on television. I knew my father had it on one of his reel-to-reels. It would take him a few days to find it amongst his vast collection but in the mean time, he would find early recordings of me being interviewed for the Saturday night dinner gang hanging out at our house. I was the main attraction at 2 years of age and fifteen minutes before my bedtime. Those recordings captured not only dad and me but you can hear my mom’s voice of encouragement in the background as I recall in the memoir. Dad’s interest in music was instilled in me and he knew we had a connection whenever we were apart. In order to keep our connection alive, dad recorded his collection of 50s hits onto 8-track tapes for me to listen to. The songs of Buddy Holly, Elvis, Little Richard and various others stashed in a non-descript cardboard box in the attic which would only see the light of day when I came home. Which leads me to the greatest gift I have ever received from my life – my stereo console. It consisted of an 8-track tape player, phonograph, with 33, 45, and 78 speeds, AM/FM radio, two speakers and the all important headphone jack. Dad also bought me a pair of KOSS headphones which became my best friend as I could crank up not only dad’s tapes but KISS at high volume. Now it was not always 50s tunes at the beginning. I also had an affinity for the Beach Boys and hold onto your hat, the first 8-track dad bought for me is the Osmond Family singing their classic hits. How all of this got me to U2 is wonderment but dad was just as influential as my stepfather. His love of music, contemporary art and woodworking didn’t go unnoticed. His love for life has never left me either. What is gone sadly is the T-bird, that 1972 boat classic car with leather interior and opera windows. I remember sitting in the shotgun seat, on a cushion so I could see over the dashboard, wearing my black sunglasses, tough skin jeans and wearing the latest cool tennis shoes from Sears while sat behind the wheel as we cruised Des Moines with the tape player playing. I have fond memories of the parking lot 8-track tape exchange with his buddy Herb who himself was an audiophile driving an Olds 88 convertible. Those were the days. Simpler, fun and where the fascination of music began. 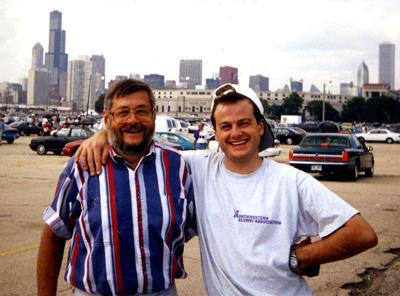 The picture below is of the two of us hanging out in the Soldier Field parking lot in 1997 two months after PopMart came to Chicago. You can see the old stadium in the background from which the PopMart arches rose. I absolutely loved reading this .. you are a wonderful writer and I look forward to reading more about you and yours. My Dad, in his own version of being an audiophile, plied me into music early on with the sounds of Neil Diamond, Johnny Lee, Elvis, Waylon & Willy, Chuck Berry and tons of other. But Neil was his musical temple. To this day I remember driving in the car with my Dad or us being at home having to do “stupid household chores” like dusting or dishes and the Neil Diamond 8 track or 33 would pop in and the strains of Cherry, Cherry suddenly didn’y make chores so boring.